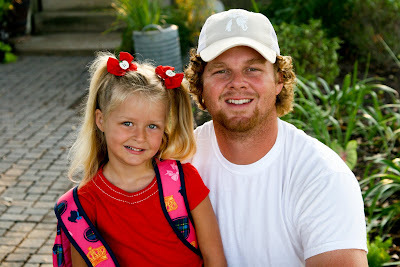 Kaylyn officially started Kindergarten on Monday! She handled it like a champ! 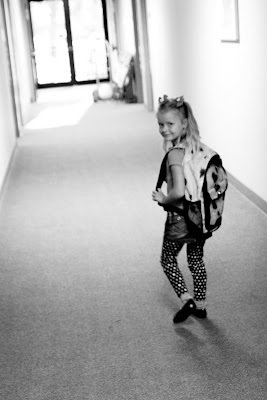 We had a few tears shed over seating situations when she arrived to her class. She isn't a fan of one of her neighbors. Last year, we had the most amazing Pre-K teacher. We are still in love with her and she has become a friend of mine. So, throughout the summer we had several talks about Kaylyn having a new teacher for Kindergarten. 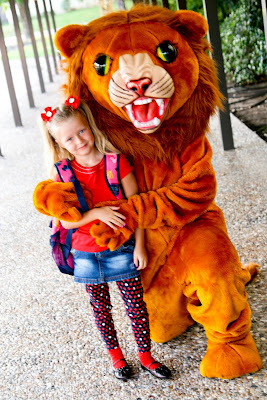 She informed me on numerous occasions,"Mommy, I'm just going to keep walking on by my new class and go straight in to my old." For a while there she wasn't budging. 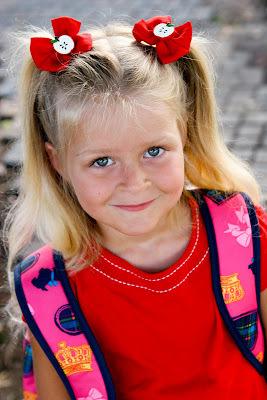 Her new Kindergarten teacher stole her heart on the first day. While Kaylyn was crying and after I had left (her crying.....which sort of tore my heart out), her Kindergarten teacher came over and prayed with her. How sweet! We are blessed to be at the school we are at. Its a Christian school. Throughout the day she is still hearing about the Lord. I'm not discounting the fact that the home is THE primary place in which you are to teach your children about Christ. But, its nice to know that she will be hearing that throughout her day at school as well. 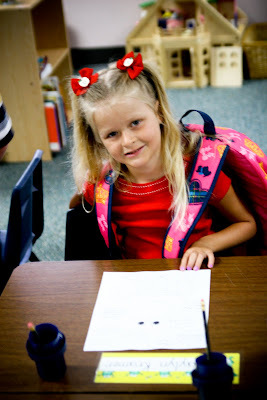 When Kaylyn arrived in the car the first day from school, I asked her what she thought about her new teacher. 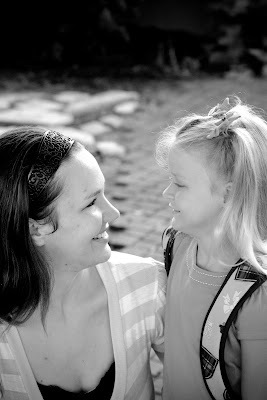 To which she replied,"Mommy, I didn't know if my new teacher was nice or mean until she prayed for me when I was sad. Then I knew she was nice. I like her a lot." 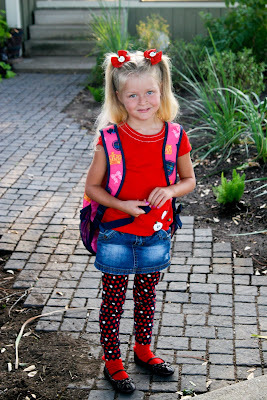 Its hard to believe that my baby *glow worm is now in Kindergarten. I remember the day we brought her home for the hospital. And now look at her. All dressed up in an apple ensemble ready to go to Kindergarten. Crazy! When she was two, I NEVER thought this day would come. I always thought that we had plenty of time to pray, think through, dissect, and know exactly what we are doing in regards to schooling for her. Its so hard in the world today to know. Thank the Lord we have a sovereign God who loves our children far more than we ever could and knows the plan of all of their days. I have to cling to that! For right now, I do have a peace about where she is at. But, it may look completely different next year. Who knows???? Only God. So, we'll be trekking through Kindergarten this year. I'm pretty sure that my photography blog has fallen to the wayside. I haven't been doing much photographing lately other than my usual- cows, pigs, chickens, and not to mention the two-legged blond critters that live in my house. But, I had to share these with you. 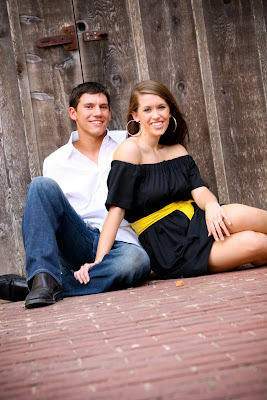 This week I had an engagement photo shoot (my fav) with a super sweet couple. Its a blessing, really, that they've asked me to be a part of such a special day to this family. We adore this family in every sense of the word so its no surprise that we had an absolute ball tromping around downtown Brenham and the bride-to-be's parent's farm (Tara Farms). Sidenote: If you ever need a getaway to the Brenham area or live in the Brenham area and still need to getaway, Tara Farms is an absolute masterpiece. I'm taken away every time I visit them. Oh, and they have the most adorable B & B cottage in town too! Go check it out! Speaking of Tara Farms, that will be where their wedding takes place. How excited am I???? Way! 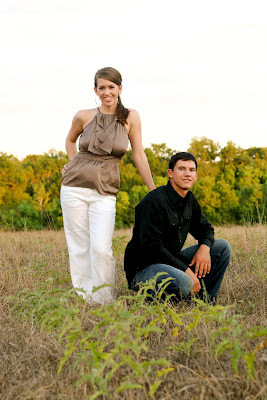 I give you some of my favs from Nathan & Paige's engagements! These cats know how to dress and work it. 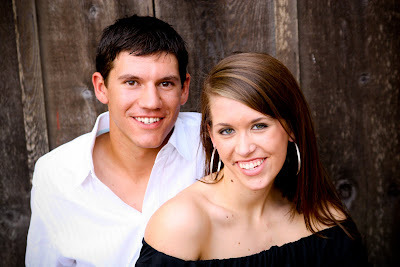 They were so fun to photograph! I loved every minute of it. You can ask them. I think I said "Cute" 5 million times during the session! Thanks y'all for being such troopers and awesome to work with! Let's try this again, shall we??? Forgive me! I've been without my MAC! I went and actually looked at my blog post and realized there was a random bear eating fish in the video posted below (of which I deleted). Above is the trailer for Food Inc.. I talked about it in the post below. I realize the effect might not have been the same had I had the actual trailer on my blog and NOT a bear in a river eating a fish. No my friend.....that was not meant to be there. Gotta love cyberspace! this is our heart's cry. I recently discovered a movie that came out in June. Unfortunately there isn't anywhere near us that is playing this movie. You will have to travel to either Austin or DFW to view it- of course! However, I would love to purchase this when it comes out on DVD and have a viewing party on the farm. How cool would that be to watch this movie with cows "mooing", chickens "clucking", and pigs "rooting" in the background? I can smell the organic non-GMO popcorn popping right this minute. Oh man- and a big screen right up against the barn with viewers sitting below on quilts. I encourage everyone to watch this trailor and browse around the website. And if you happen to be fortunate enough to live nearby a movie theater showing this movie, go see it! Something pretty precious occurred as Kaylyn and I were watching the trailer for the first time. Towards the end, the trailer shows images of "good farming practices" in which you see animals all on pasture- the way that it should be. KK said outloud as they were showing these farms,"Hey, momma. That's our farm." This proud momma beemed with delight! Of course I'm pretty sure it was Joel Salatin's farm (since he was the one doing the talking), but still. She recognized what our farm- a real farm- looks like. The movie is call Food, Inc. They have an incredible website with a wonderful blog filled with lots of good information. The more awareness we can bring around eating locally and supporting farmers around you, the better off our economy will be. I fully believe that. On top of boosting our locally economies, there is no comparison to eating meats raised solely on pasture when it comes to health benefits and humane issues. I could open up a entire can of worms on eating locally and supporting local farmers. But, I will save that for another post. But, for now, I'll leave you with one last thought. One thing we, as the consumer, must understand is this (a quote from the movie). "When we run an item past the super market scanner, we're voting. For local or not. Organic or not." I've tried for about 2 hours (with lots of interruptions of course) to post the trailer right here on this blog.....but, I've not been successful. So PLEASE PLEASE PLEASE go over and watch the trailer and let me know what you think. If it doesn't pop up here......CLICK HERE FOR THE FOOD INC. WEBSITE! !